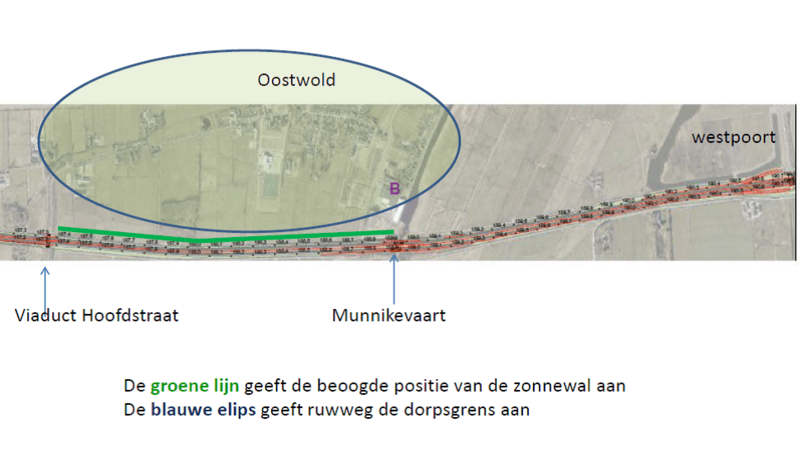 A group of residents of the village Oostwold (gemeente Leek) has been working since 2014 to build a revolutionary, noise reducing “Zonnewal” (“solar wall”) alongside the highway A7. The Zonnewal will be a highway noise barrier and solar panel installation in one. The wall will be, in terms of solar energy produced, bigger than anywhere else in the world. The choice for a “solar wall” instead of, for instance, solar panels on all roofs in the village, is pretty much logical for Oostwold: the village has rare combination of a very busy highway in a very close proximity, which runs almost exactly from East to West – with the village on the North side of it. This provides an optimal situation for energy-production, because the installation will face South almost perfectly and the slope of the wall will give the solar installation an optimal angle. The noise of the highway, which is increasingly perceived as a nuisance by the village inhabitants, will be greatly reduced by the noise barrier. The Zonnewal will also block the unhealthy particular matter from vehicle emissions. 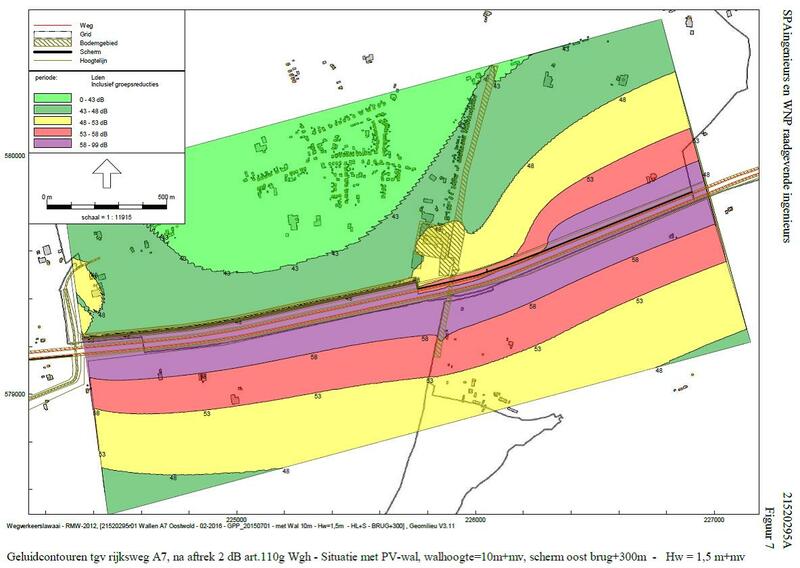 And, with the Zonnewal, the village will be completely sustainable overnight and 100% energy self-sufficient. The Zonnewal will be built alongside de A7, next to the Rijkswaterstaat area. It will be 1,6 kms long and will be placed between the Lettelbert viaduct and the Munnikevaart canal. On the wall, 9000 m2 of solar panels will be placed at 6m height over a total length of 1500 meters. It is a 1,62 Megawatt installation that produced aprrox. 1,35 million kWh per year. The installation can provide 435 households, with an average energy consumption, with electricity. By giving the Zonnewal multiple levels on the village-side, a bikeway, walkway and bridle way for horseriding can be built, so the wall also has multiple recreational functions. Cross section of the wall. Highway A7 on the left, village side on the right. You can see a walkway, bikeway and bridleway. On the village side, the Zonnewal will be planted with trees and bushes so it will blend in with the landscape. This will make the Zonnewall virtually invisible when seen from the village side. Engineering bureau SPA WNP has canculated the noise reduction that will be provided by the Zonnewal. There will be a reduction of about 10 dB of the highway noise. In terms of noise reduction, this can be called a vast reduction of the noise and roughly – under average circumstances – a 50% reduction of the perceived noise. In the image below, the current measurements are shown on the left and the projected values, with the Zonnewal in place, are shown on the right. 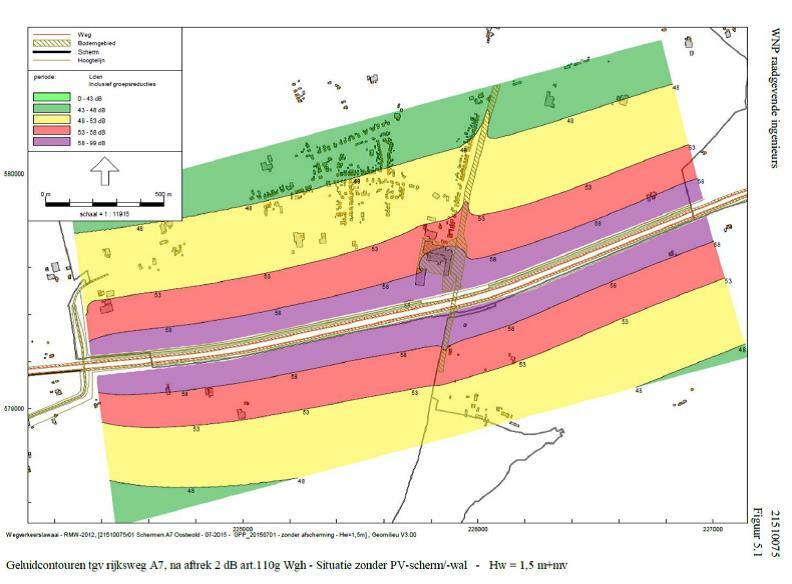 In order to attain a reasonable reduction near the Munnikevaart (canal area on the right), a separate noise barrier / panel construction is needed to be placed near the highway viaduct, which connects to the Zonnewal. Currently we are in talks with the many parties involved to make this project happen. On this website, we keep you posted about the progress. If you want to be the first to know the latest developments, you can click here.